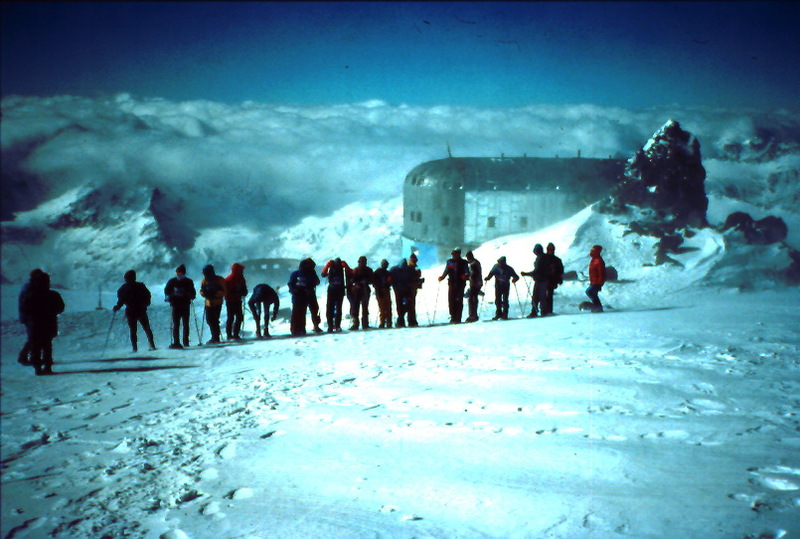 "Balyberdin" Elbrus Races (1989-90). The story by Kevin Cooney. When my good friend Beth Wald called me at home in Boulder and said 'could you take a Russian friend who is staying with me out for a trail run or something and try to wear him out' I thought that sounded like fun! Soon I was going hard up Green Mountain (a small peak near my home in Boulder Colorado) with Anatoli Boukreev chasing me. Over the next few weeks, Toli and I got to know each other through exercise and a limited shared vocabulary - mostly translated by Beth - while Toli absorbed American culture for the first time (like how to select from a whole row of ice cream selections at the grocery store). 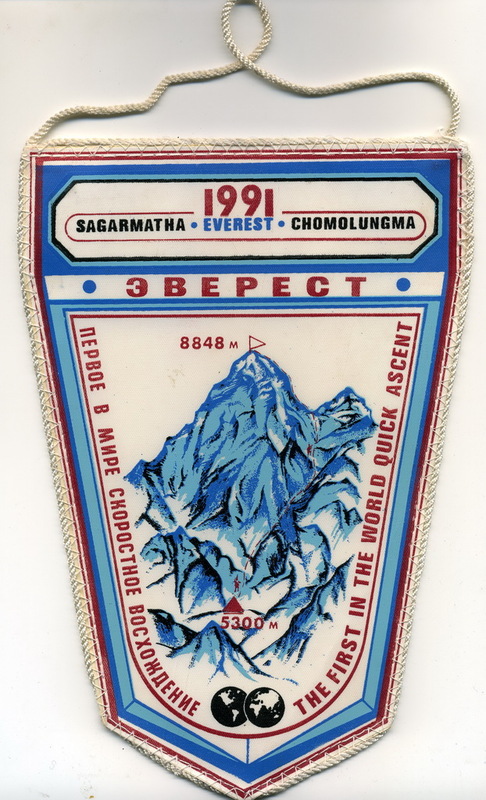 I was intrigued by the Soviet training methods in the mountains, based on the successes in the Himalaya I knew about, and the idea of visiting a culture that had largely been closed to Americans for as long as I could personally remember added to the intrigue. Anatoli invited me to come over that fall and race up Mt. Elbrus, the highest peak in the Caucasus - and with Beth's help, arranged for our friend Patrick Healy and me to be invited to competition on Elbrus that September. 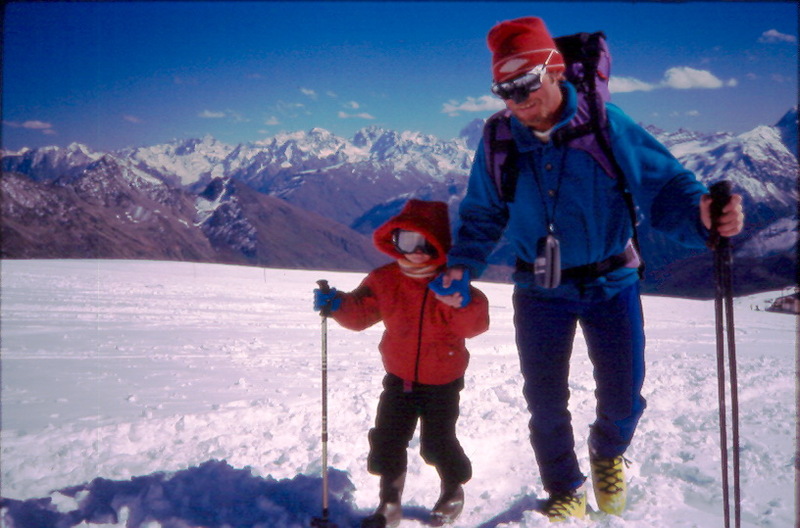 Patrick and I were excited to travel to the Soviet Union and learn more about the high-altitude training methods and alpine competitions in the Pamir we'd heard about from friends who had participated in an American Alpine Club exchange in the late 1970s. 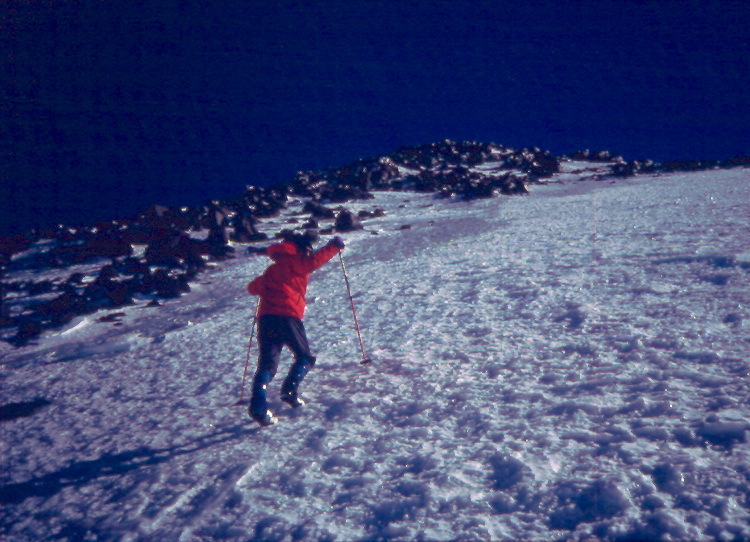 We had no mountaineering events like that in the U.S. at the time. 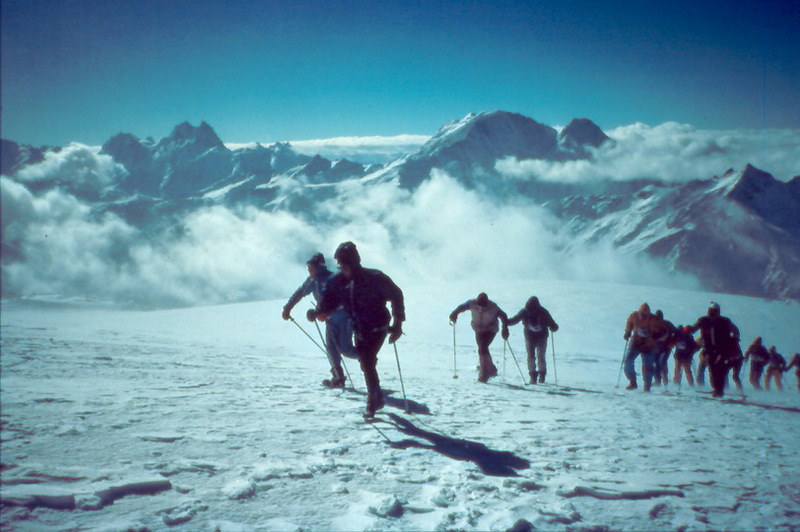 Soon we were getting faxed letters from a mountaineering club in Russia to allow us to get a visa to visit the Soviet Union for the Elbrus race. 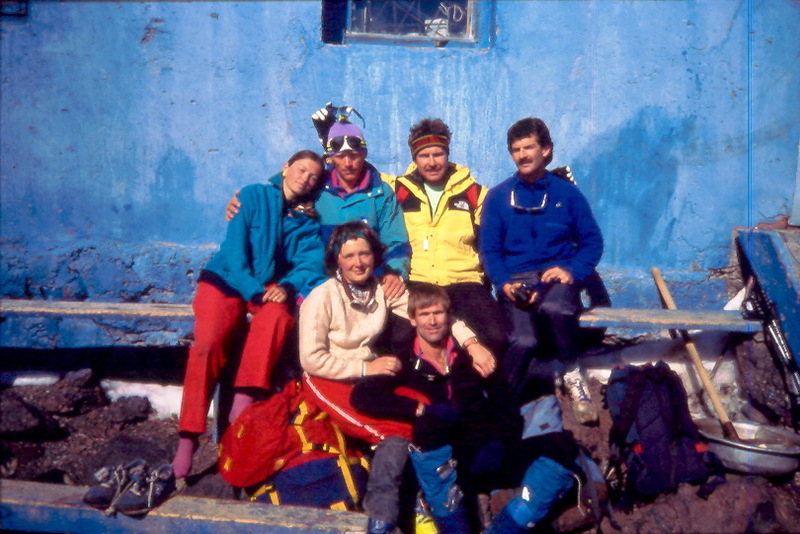 Being the cost-conscious climbers that we were, Patrick and I scrounged for the cheapest way to get to St. Petersberg (still Leningrad at that time) to meet our friends Alexei and Anatoli, and travel from there to the Caucasus. That meant a flight to Helsinki and the train to Leningrad. Luckily when we arrived there, tired and not able to say any Russian words beyond spaceba , our friends quickly whisked us from the train station to some waiting tea, vodka, and late night conversation. After a couple of days enjoying the museums and beauty of St. Petersberg, it was off by night train to Moscow, where we visited a variety of places so quickly it was a bit of a blur. We caught a flight to Mineralnye Vody, which was much further than we had imagined. At this point, the 4 of us, Patrick, Anatoli, Alexei and I - bought fresh fruits and vegetables to accompany the mountaineering food we brought from the U.S. - and Patrick was able to persuade a taxi driver to take us into the mountains by offering him some Marlboros from the U.S. - still a rarity in the age of Glastnost we had heard. 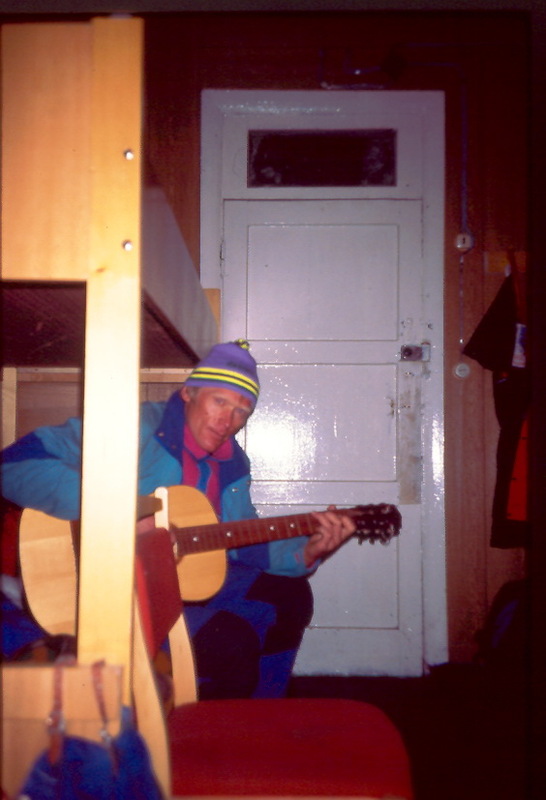 We finally landed in a mountain hut undergoing some repairs and sorted gear several times while rains continued to keep us indoors except for a few forays onto the local bouldering circuit, and some trail runs. 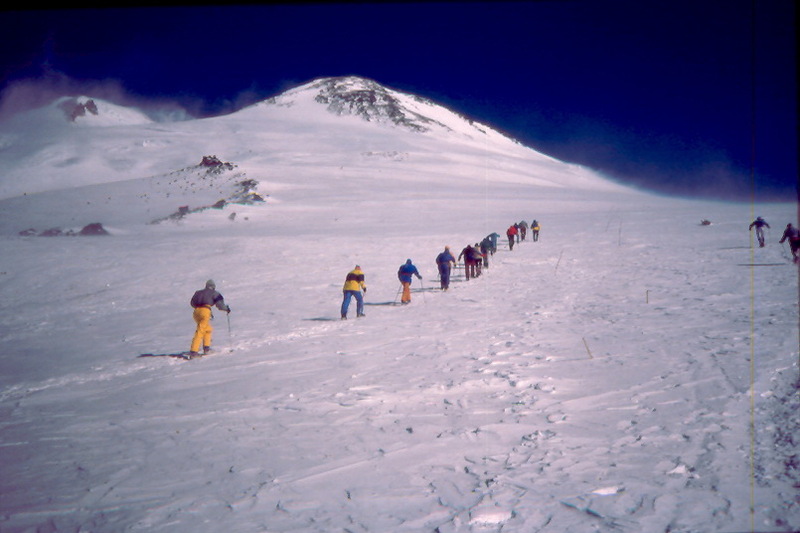 Eventually we headed up a glacier as a foursome to try to bag a peak and get acclimatized before the upcoming race. 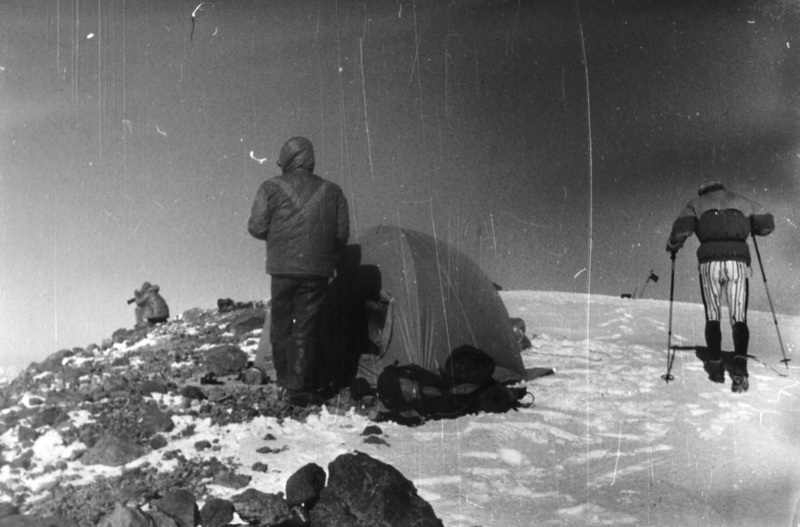 It continued to snow for the next several days, and we headed back to the hut, not having come close to any summits or even getting a good view of them. 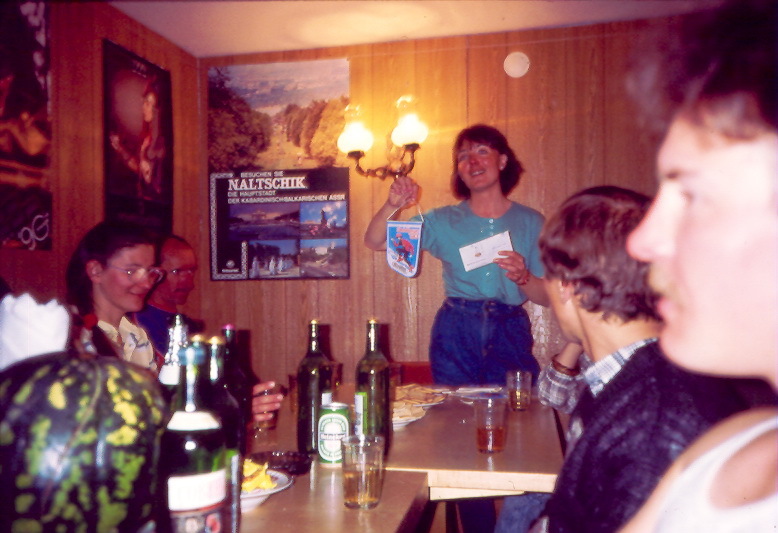 But the stormy days were filled with Toli playing 'Zoika' and other Russian folk songs on the guitar - and someone always trying to get us to make a toast some another round of vodka. We could not keep up. We caught a ride in an rescue ambulance up the valley to the base of the ski area on Mt. 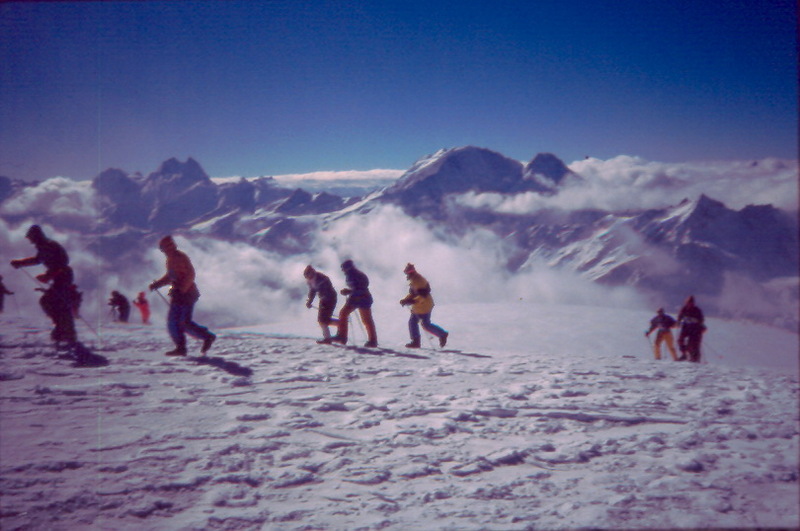 Elbrus, and headed up to Priutt 11 a few days before the scheduled race. Other racers were arriving from various Soviet Republics, fresh from training in the Pamir or the Tien Shan. Since the previous week the weather had not cooperated, Patrick and I really felt like we needed some acclimatization. 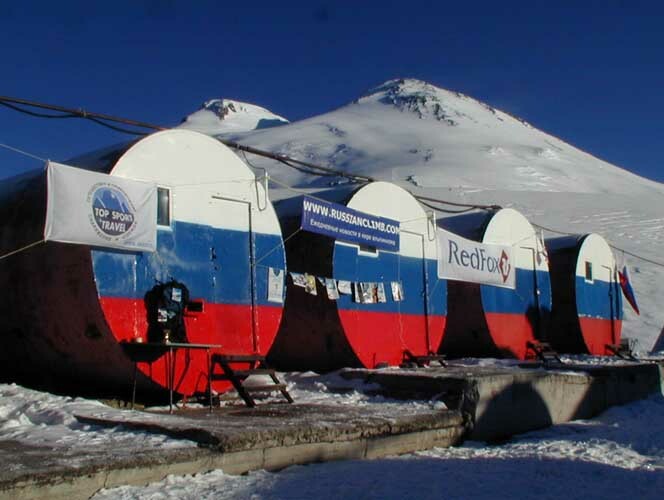 So - we decided to go right up and camp on the saddle between the two summits of Elbrus. Toli and Alexei said they'd just hang out at Priutt 11 with the Australian team and their pretty translator. Patrick was feeling punk from too much vodka and cabbage, and I underestimated how windy that saddle could be. Our sleep-high approach to acclimatization would have to wait. We headed back to Priutt 11 and enjoyed tea and folk songs with our friends. 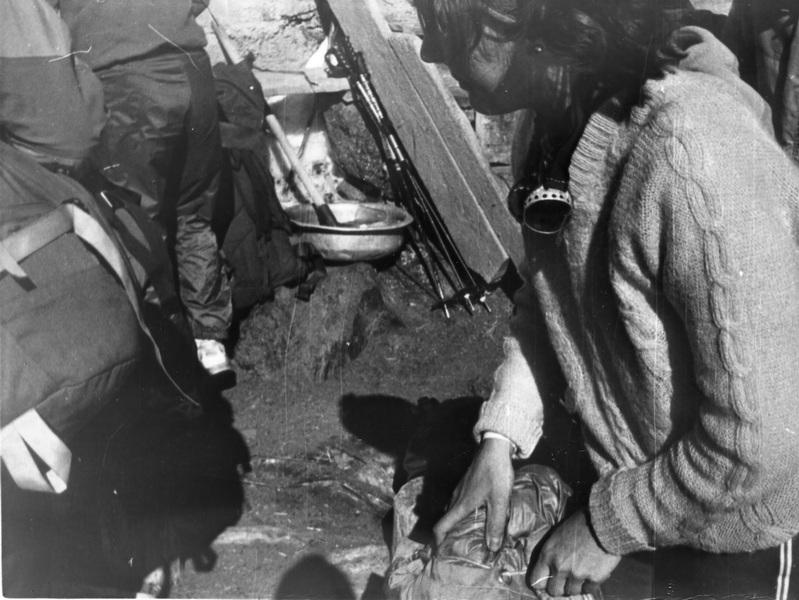 Balyberdin and his assistant race director, a lovely woman who had lost her husband to the Pamirs, announced there would be a 'preliminary' race to a midway point up the mountain that afternoon. Everyone was required to do it, but the time did not count toward the final result. 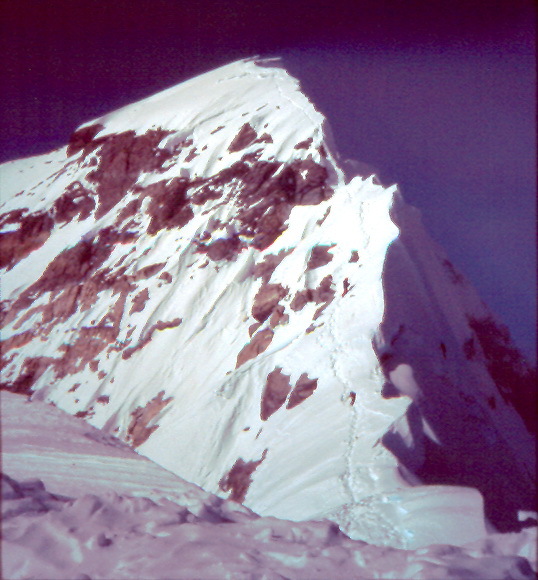 The race to the summit would be the following day. The 'prelims' were a quick dash - an opportunity for Patrick and I to try out our secret weapon. We had sneakers provided by Nike - designed for javelin throwers - that had spikes in the heel, as well as the toe. 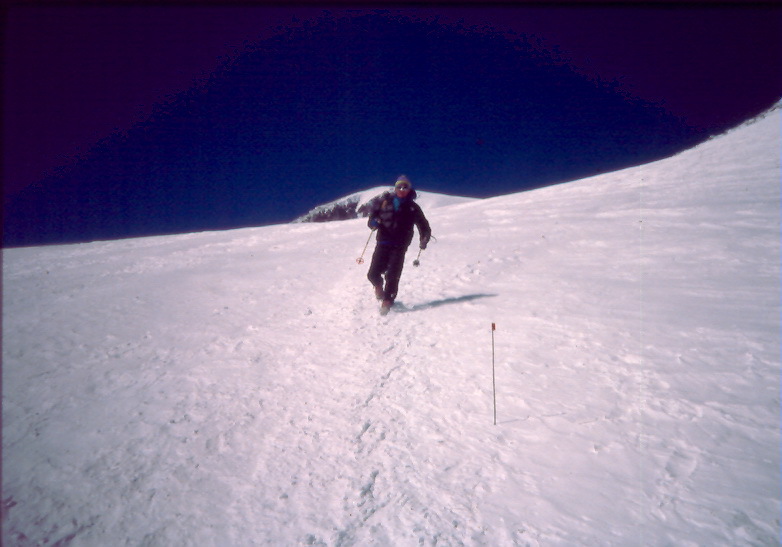 We figured, the weight savings of not having a boot and crampon could help us run uphill faster. The javelin shoes worked like a charm - we were psyched! While several of us were standing around the mid-slope finish of the day's timed event, we heard a deep scream. We saw one of the competitors sliding down the icy slope, arms and legs flailing about. We quickly ran back down to where he'd landed. He was pretty beat up - bloody knuckles, cuts and scrapes on the face and a badly twisted ankle. It took the help of several competitors to get the poor fellow back to the hut, but by nightfall, he expressed no pain - but I know that was the vodka talking. The finals started early the next morning. The wind was howling and no one really wanted to go outside until it was time to start. No casual stretching and jogging to warm up. The amazing thing is the crew that started for the summit in the dark, in order to be official timers and provide first aid and hot drinks at the top. The starting gun went off! I told myself to keep Toli in my sights, but not to go out too fast, as I was not sure of the pacing required. As we went up the first direct portion of the mountain, there was a small group of us 'running' together, including Patrick and me. It seemed we quickly gained the high point from the prelims, and then there was a traversing climb to the left. I was feeling surprisingly strong, and found myself out front with just Toli for company. I was zoned in on my breathing, head down and going. I looked up and saw that Toli was headed off the track to the saddle, and straight up to the right. Everyone we met at the event was incredibly nice to us. There was a full evening of swapping stories, planning expeditions, and drinking toasts to international cooperation. While we had brought trinkets from the U.S. to share, we were given gifts I cherish still - from an inlaid knife to babushka dolls. There was a formal awards ceremony somewhere along the way, and Patrick and I were surprised to learn that we had won cash prizes for placing well in the race. Later, back in the street markets in Moscow, we would spend some of the rubles buying art as gifts for our families back home - and leaving the remaining ones for our Russian friends who had been such gracious hosts. 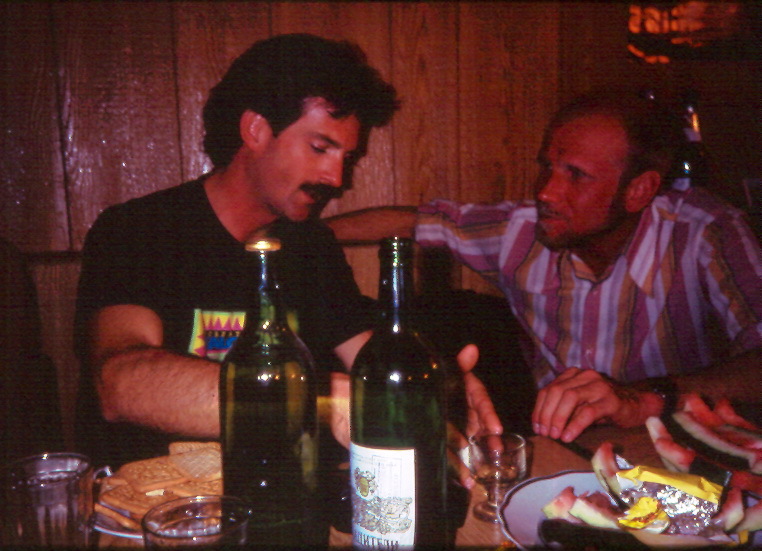 Over the next several years, Anatoli would become a close friend of both Patrick and me, spending months at our homes in Boulder between sojourns to the Himalaya. He would work for Patrick's landscape company, rock climb with me, fawn over Beth, and study his English - while he trained and planned his next expedition. 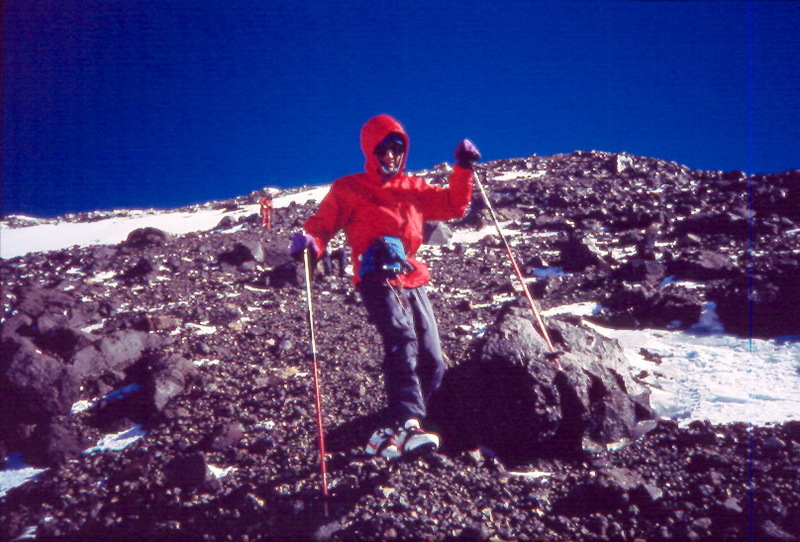 Toli had an impact on everyone he met, and he developed a strong group of friends across America, joining many of them on trips to the big mountains. I will miss both Balyberdin and Anatoli - they both are gone too early. With a few more years, I might have gotten the chance to wear Toli out once.